Advances in neuroscience have provided a roadmap for the brain that shows us the key to working with anxious minds. But knowing how to interpret the complex map neuroscience provides has left many clinicians wondering… How do I unlock the complicated inner workings of the brain to guide my client sessions? 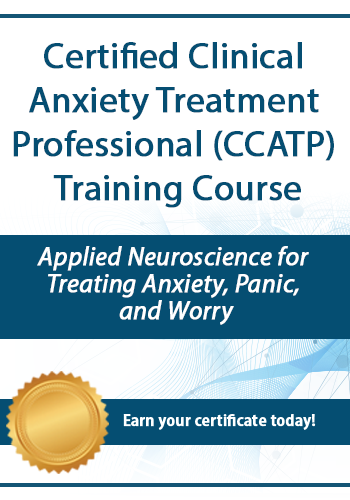 In this new, comprehensive certificate training, you’ll see how neuroscience can inform why, how and what techniques can help your clients stop the symptoms of anxiety — even the tough to treat panic attacks, worry, rumination, nausea, and pounding hearts. Now you can join Catherine Pittman, Ph.D., HSPP, for a comprehensive step by step clinical training on how you can revolutionize your anxiety treatment approach with the power of neuroplasticity. More than just the neurobiological "whats and whys," you'll also learn the "hows" of actual treatment — so you’ll know exactly how to empower your clients with strategies to resist anxiety-igniting cognitions. You’ll end this course with your Certificate in Applied Neuroscience for Treating Anxiety, Panic and Worry and be fully prepared to integrate brain-based strategies that motivate lasting change for calming the mind — even in your most anxious, worried, traumatized, or obsessive clients. Earn up to 18.5 CE Hours — included in the course tuition! become a Certified Clinical Anxiety Treatment Professional. Today's advances in neuroscience have provided us with more evidence-based explanations about the causes and treatment of anxiety-based disorders than any other clinical disorder you'll see in your practice. Through 10 comprehensive modules, you'll learn through easy-to-understand language how you can apply neuroscience to your anxiety treatment plans to effectively and easily modify the processes in the brain that give rise to anxiety — so you can help your clients find deep, lasting relief from panic, worry, trauma, and obsessions. Module 2, you'll learn how the amygdala fuels anxiety and how amygdala management can improve your client's level of functioning without the use of medication. Even when you don't prescribe medications, it's important to understand how medication impacts your treatment plan. In this module, you'll learn how your partnership with prescribers can improve overall client education on how medication affects clients and their therapeutic goals. Using exposure can help teach the brain new, positive ways to respond. In this module, you'll learn to safely and effectively use exposure strategies to create new emotional learning. Our clients with anxiety or depression may be so tuned into worry or rumination that they aren't aware of their experiences. When we introduce Mindfulness to the anxious brain, we provide an evidence-based avenue for changing the brain to be more resistant to anxiety and its symptoms. In this module, you'll work on increasing the effectiveness of CBT tools by using neurologically informed interventions. You'll learn exactly what to do to use this skills-based approach to help your clients practice new behaviors and strengthen new neural connections to ease their anxiety. With some estimates showing that 60% of those with anxiety will also have symptoms depression, you are likely treating individuals for both disorders. In this module, you'll explore the link between anxiety and depression and learn how you can more effectively improve both disorders through interventions that help make the brain more resistant to anxiety and depression. When clients have obsessive, ruminative and worry-based thinking, clinicians can easily get caught up in the process. In module 9, we’ll cover effective approaches for working with OCD and GAD that ensure we don’t co-obsess. Making OCD or worry the adversary: Don’t be bullied! Breakthrough research shows we can modify and erase old memories through reactivation – which can reduce anxiety symptoms quickly. In this final module, you'll explore step-by-step how to safely use therapeutic memory reconsolidation to improve anxiety treatment. Are you ready to step into the life awaiting you as a Certified Clinical Anxiety Treatment Professional? Get Certified and Go Further... Become a Certified Clinical Anxiety Treatment Professional and show your employer, clients, potential clients and fellow professionals your commitment to honing your skills and staying up to date on anxiety treatment best-practices. The awareness boosting methods in this guidebook offer a means of reappraising and observing negative and anxious thoughts, habits, pain, and stress in fresh ways that produce new insight, positive change, and a sense of hope. 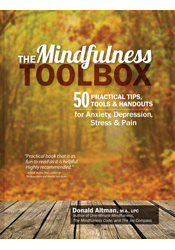 Featuring over 40 easy to use, reproducible handouts and expertly crafted, guided scripts — such as working with the breath, overcoming depression with here and now pleasantness, calming the anxious mind with sense grounding, expanding a client’s strength narrative, the stress pause S-T-O-P technique, and meditations for peace, acceptance, and re-envisioning pain — this book is ideal for clinicians wanting to integrate mindfulness into their work. 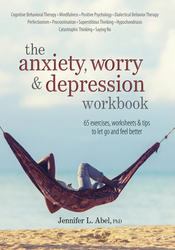 This interactive workbook will help you tame anxiety, worry and depression. Backed with science, this easy-to-use guide is full of practical, proven worksheets, self-monitoring forms, exercises and scripts for you to start changing habits and the lives of your clients. In this exclusive Q&A call recording, Catherine Pittman, Ph.D., HSPP, addresses questions directly from course attendees and shares additional insight into improving therapeutic outcomes with anxious clients. Catherine M. Pittman, Ph.D., HSPP, is a professor of Psychology at Saint Mary’s College, Notre Dame, IN. Dr. Pittman is the author of the popular book Rewire Your Anxious Brain: How to Use the Neuroscience of Fear to End Anxiety, Panic, and Worry. She has a background in cognitive behavioral therapy, neuropsychology, fear-conditioning research, and have been treating anxiety-based disorders in clinical practice for over 25 years. Catherine’s experience makes her uniquely qualified to provide a clear understanding of neuroscience and how that informs the selection and application of successful anxiety treatment strategies. She regularly presents workshops at national conferences and national webinars on anxiety treatment, and is an active member of the Public Education Committee of the Anxiety and Depression Association of America. 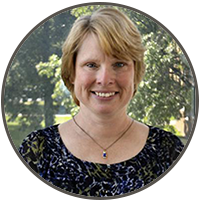 Speaker Disclosures: Financial: Catherine Pittman is an associate professor at Saint Mary’s College. She is an author for New Harbinger and receives royalties. Dr. Pittman receives a speaking honorarium from PESI, Inc. Non-financial: Catherine Pittman is a member of the Anxiety and Depression Association of America. This certificate training has been specially created for professionals who work with anxiety, including counselors, social workers, psychologists, marriage and family therapists, teachers, occupational therapists, case managers, addiction counselors, nurses, and more. The education provided in this intensive online training is designed to breathe new life into your clinical treatment plans for clients who are struggling with feeling anxious, worried, traumatized or obsessive. Earning your certificate meets the educational requirements to become a Certified Clinical Anxiety Treatment Professional (CCATP) through the Institute of Certified Anxiety Treatment Professionals. 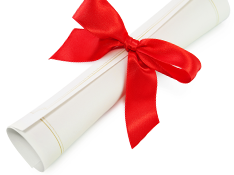 Learn more about certification requirements here. Watch your email for your order confirmation, and get instant access to the comprehensive training plus the free bonus materials — all designed to help you effectively integrate proven treatment strategies for anxiety, panic and worry into your practice. Click here for course objectives and outline. Access all course videos and materials online forever. Review the course materials at your own pace and at your convenience! Plus, use the CE21 Mobile™ app to access the course content on-the-go, wherever and whenever you want on your mobile devices. Instantly collaborate with other professionals on the course materials through interactive message boards. You'll be part of a community of hundreds of practitioners all focused on mastering anxiety treatment, providing valuable opportunities to share insight and experiences and to build your professional network. Complete your online CE tests and earn up to 18.5 CE Hours! Click here for total course CE Credit and credit details specific to your profession.